Nice pair of hand painted figurines measure 6 3/4" tall and are hand painted bisque china. 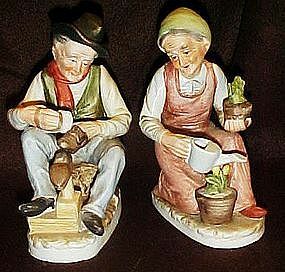 The old man sits and shines his shoes, and the lady is kneeling and watering her potted plants. Made by Ardco. Both pieces are in excellent codition, and sold as a pair.